Over the past decade or so, treadmills have become quite advanced pieces of cardio machinery. They now feature everything form full TV screens to heart rate monitors, calorie counters, and much more. The ProForm Pro 2500 treadmill is a perfect example of just how far the typical treadmill has come: This premium model offers a color screen, a fascinating number of unique data points during the workout, and pre-programmed routines that will challenge even the most seasoned runner and cardio endurance enthusiast. Its large size and spacious belt allow for capable training of even the tallest people, while its affordable price tag allows it to become a central part of the typical home gym without breaking the bank or requiring a gym membership in any way. Unlike many competing treadmills on the market, the Pro 2500 switches out the LCD screen for a color LED screen. This allows for brighter, bolder notifications and data point monitoring throughout the workout. The “QuickSpeed” feature allows for very fast adjustment between running, walking, and cool-down speeds, ranging from zero to 12 miles per hour. Inclines and declines are permitted with this home treadmill model; up to a 3 percent decline can be utilized during training, as can an incline of up to 15 percent for those who prefer to run a steep hill during their routine. Dual heart rate grips on either side of the treadmill allow for precise, incremental heart rate monitoring so that fitness enthusiasts of all types can reach their desired heart rate level and maximize the burn from start to finish. Home treadmills omit key features far too often, which typically means that the homeowner must compromise between the robust feature set offered at the gym and the convenience of a treadmill placed in the home. With the ProForm Pro 2500 treadmill, that type of compromise is a thing of the past. This is a full-featured, gym-worthy treadmill model for homeowners that will allow them to track every metric of their workout and dramatically improve their level of fitness over time. It starts with the central LED screen, which offers full-color tracking of calories, heart rate, distance, speed, and many other metrics. The built-in iFit Live feature can synchronize workout data to numerous fitness trackers, making it even easier to track fitness and its daylong impact on calorie levels and dietary considerations. Unlike many competing treadmills for the home gym market, this one offers incline and decline features for maximum training of cardio fitness, leg muscles, and more. Up to a 3 percent decline and 15 percent incline can be established during the workout, with belt speeds up to 12 miles per hour regardless of “terrain.” The treadmill offers QuickSpeed adjustments between belt speeds, which eliminates stuttering and makes this model safer to use than many competing options on the market. 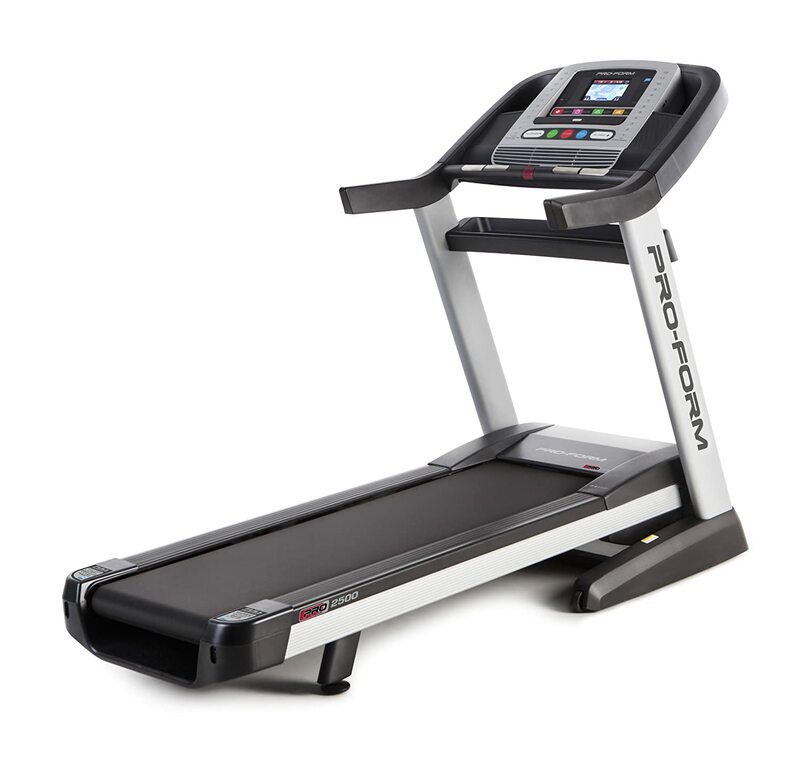 The ProForm Pro 2500 also comes with a very quiet motor, a built-in fan for maximum comfort, an iPod interface for full music connectivity, and a strong suspension for minimal wear and tear on the joints during cardio. The ProForm Pro 2500 treadmill is a great option for homeowners because of its full feature set, but those features come at the expense of treadmill weight and portability. This model weighs in at a staggering 375 pounds, which means it’s probably not a great idea for upstairs bedroom installation. The treadmill instead works best in basements and on ground floors, in areas that won’t require its quick removal or storage. Also, the heavier overall weight means that treadmill assembly will be a decidedly multi-person job. Typically, between two and three people will be required for safe and easy assembly. The exceedingly heavy weight of this model does make it more stable and safe, however, since the treadmill is less likely to shift, wobble, or fall off balance at 375 pounds.